I'm absolutely with you and the old men on preference for high RR. What I wanted to insist on is the fact that our preference does not mean it cannot be done differently. Why do I say it can be done differently? First, because money management also includes your win rate and exposure. Second, because empirically traders are making money with inverse RR without blowing up. Continuing to state that inverse RR is somehow doomed because "eventually" market will eliminate them is not fair to the traders who trade inverse RR, except if you provide evidence as to why this should be the case. in this particular case, in apposite to many other subjects related to trade, yes in my opinion there is evidences on a study made by a Darwinex concurrent, and that i know some years ago, because for me study on 43M trades in one year is sufficient..
many thanks again for your interest, and all the best to you. i wont to testify that @integracore2 prove-me (in the way it should be with consistent profitability in adequate risk) with time passed that i was completely wrong when produced that inadequate opinion about his darwins and his style of trading. sorry on that. We all can say things sometimes that we don’t mean, water under the bridge my friend. If you are ever in London or Madrid sometime, please do let me know so I can take you out for a coffee (or beers) whichever you prefer. Why OldSchool agree with recent changes on D-Score, (ask for it long time ago..), and think that are in general positive? D-Score 3M ago 55 now 70. Not sufficient? (even this exception can always happen) ok lest see one of the tops! - last 3M return -5% and DD of -13%, +63% profitable trades, average positive trades +12pips and losing -20pips and average trades daily 13! D-Score 3M ago 78 now 68. It won the Darwinia of April 2017 with a DScore of 74 . Now its recalculated max DScore is 69 . Gamblers are penalyzed, not by Rs but at least by La . You are here on Darwinex since 2015 like me. Do you think that with actual DScore and platform investors had made money with darwins available in 2015? I think no, even a perfect DScore would be useless without a decent selection of traders that we have now. That’s a good idea to increase transparency. As long as notional allocation is not added in the hall of fame, you see it indirectly there, but with a delay up to three months as only the payment is shown. I am not an expert of Zulu but I think that profit of followers is a very recent addition. BTW it confirms that a realistic return is a robust return, a return that persists in the future and is replicated by investors. 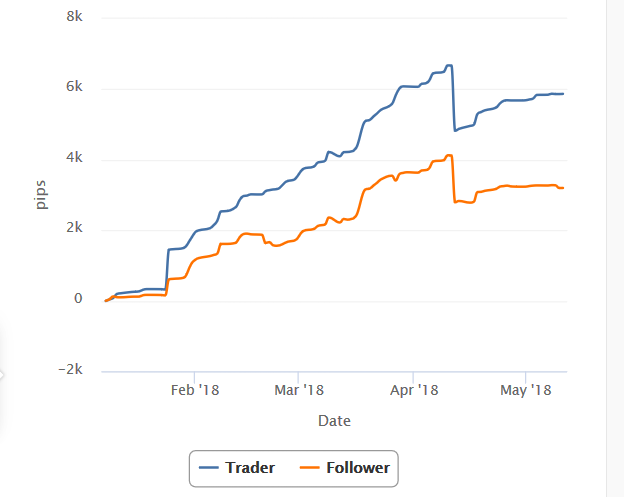 and around 3M from one of most profitable follower on one "reference" broker account. ( that i know and have accounts). I was aware about that, and that is the reason why it is very difficult to make money investing with Zulu or Autotrade. The majority of traders trade less than 20 pips , so even if you find one of the few true traders the edge is wiped away by negative slippage.